"Hello I'm Chantelle Rodgers and today I AM TAKING OVER!!!! I am a 38 year old sickle cell patient (SS) and I live in Rotterdam (NL, Europe). Wanna know what my life in The Netherlands looks like. Stay tuned! Happy world sickle cell day!" "Hey everyone meet Effie! Effie is just five months old and like myself born with sickle cell (ss). Here I am meeting up with her mommy giving her all tips and tricks about raising a child with sickle cell. We talked about holistic approaches, medicine and traveling with sickle cell. It's so important to share these personal experiences so we can keep learning from eachother." "These beautiful canals in Amsterdam. Amsterdam and Rotterdam have the largest sickle cell population in The Netherlands. The sickle cell patients in Amsterdam mainly have their roots in Ghana (approx. 60%) and Surinam, Nigeria, Curaçao. " "A healthy lifestyle is extremely important when it comes to managing sickle cell. My diet contains vegetables, fruits, nuts and seeds. I drink lots of water and (green) tea. Every now and then, when I feel like it, I eat some fish or meat or dairy products. That is usually once a week. I believe that switching to a primarily plant based (vegan) diet really contributed to my health. I haven't been hospitalized since 2015, and yes I am an SS patient. Of course other things like exercise and rest are also important, but I strongly believe in a hollistic approach when it comes to sickle cell. To me that's: a healthy lifestyle (food and excercise), acupuncture and staying close to nature (limit the use of chemicals on hair and body)." "These earrings, tho!!! 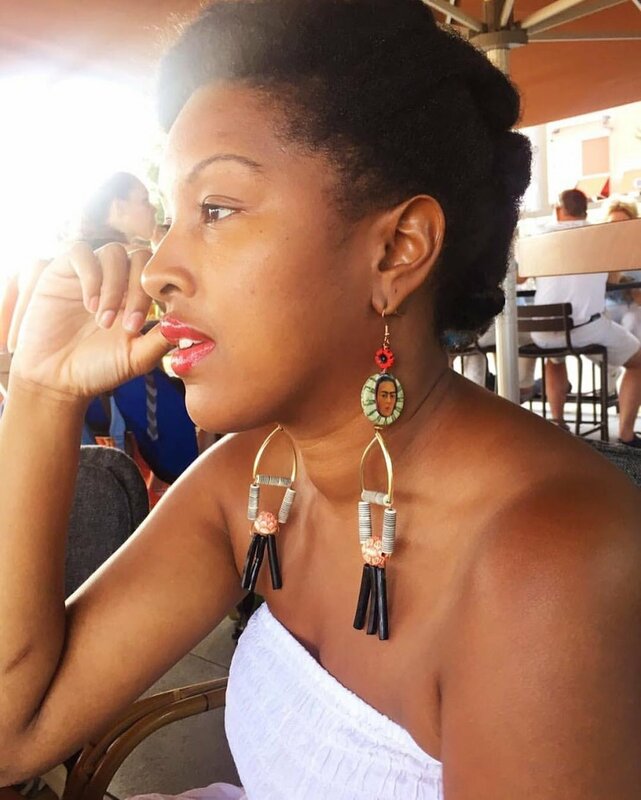 So I'm rocking my Frida Kahlo earrings on this World Sickle Cell Day for late afternoon drinks (6 hours time difference). Frida Kahlo was a Mexican Artist who got in a bus accident where she suffered nearly fatal injuries—an iron handrail impaled her through her pelvis, fracturing the bone. She also fractured several ribs, her legs, and her collarbone. She spent a month in the hospital and two months recovering at home. To occupy herself during her recovery, she began to paint with an easel that made it possible for her to paint in bed. A mirror was placed above the easel so she could paint herself. Painting became a way for Kahlo to explore questions of identity and existence, and she later stated that the accident and the isolating recovery period made her desire, "to begin again, painting things just as I saw them with my own eyes and nothing more". I truly believe that art (in any form) can be a way to cope with a painful disease like sickle cell. At IXL Sickle Cell Awareness we use artistic projects to raise (global) awareness. This can be exhibitions of sickle patients in a crises, as well as a spoken word workshop to learn how to express yourself dealing with this disease. In our approach we work with dutch artist, Winne, as well as international artists as Prodigy."